What utilities does XOOM Energy service in California? Currently, XOOM Energy California, LLC supplies natural gas in: Pacific Gas & Electric (PG&E), San Diego Gas & Electric (SDG&E) and Southern California Gas (SoCal Gas) territories. Why is there a "transmission" charge on my SoCal bill? The transmission (or distribution) charge on your natural gas bill represents the cost of delivering the gas commodity on the Utility’s transmission/distribution system to your home or business. In most every market served by XOOM Energy, this cost is identical for customers of both energy retailers and utility companies. One exception to this can be found in the Southern California Gas Company (SoCal) market. As a result of a pipeline settlement from 2003, consumers supplied by energy retailers (such as XOOM Energy) were granted proceeds via a bill credit on their SoCal invoice. This credit applied towards the transmission portion of their invoice, and initially provided a savings over the utility (SoCal) transmission rate. In an attempt to distribute the settlement proceeds fairly, SoCal has alternated between over-crediting (2013, 2011, 2010 & 2008) and over-charging (2014, 2012, & 2009) customers on their transmission charges. The current charge equates to approximately $.86 per month (for a residential customer of XOOM Energy in the SoCal market). Discussions with SoCal indicate that very minor annual adjustments lie ahead and slight fluctuations will continue until they are able to balance the distribution equitably. Once this process has been resolved, the SoCal transmission rates should once again become universal across the entire customer base. If you have any questions, please contact SoCal directly. What is natural gas deregulation? Natural gas deregulation has been around for more than two decades in certain states, and is designed to ensure consumers have access to adequate and competitively-priced energy supplies. While your local utility is still responsible for maintaining the pipes that make up the distribution system, reading your meter, issuing the bill and responding to emergencies, the utility no longer holds a monopoly on the gas service. While in most deregulated markets you can still purchase your supply from the utility, you now may choose from multiple competitive suppliers that offer various service plans at competing rates. How will my utility company know I’ve enrolled with XOOM Energy? Your utility company recognizes us as a licensed supplier of natural gas. When your XOOM Energy enrollment is approved, we notify your utility company of the change through our systems, and XOOM Energy becomes your supplier of record. No. You are never at risk for service disruptions for switching to XOOM Energy. In fact, you will see no difference in the service you are receiving. The only change will be in your billing, where you will be billed according to the service plan you selected. A variable rate plan allows you to purchase gas at market-based prices that change from month to month. While a variable rate is subject to monthly price increases or decreases, it may help you realize the lowest possible cost in the market. However, it also exposes you to potential price increases, and, unlike a fixed rate, a variable rate does not protect you against price volatility. Variable rate plans may be higher or lower than the utility rate. In order for XOOM Energy to offer and fulfill its term obligation to you, we have to purchase gas in advance of usage to cover the entire length of your contract. If you cancel your contract early, XOOM Energy needs to offset the cost of selling the unused portion of your gas to others. The cost recovery fee covers this cost and any other expenses we incur because of your cancellation. When will my service become effective with XOOM Energy? XOOM Energy service will typically commence on your meter read date immediately following your successful enrollment in our program, meaning it may take up to 30 days. In some cases, it may become active upon the second-meter read following your enrollment. In this case, it may take up to 60 days before your service commences. Pacific Gas & Electric customers: Your utility company will continue to bill you as they always have. XOOM Energy gas supply charges will appear along with your utility service and delivery charges. You still make only one payment to your utility company. *Click here to see how to read your XOOM Energy Bill. Does XOOM Energy offer discounts to CARE program participants? 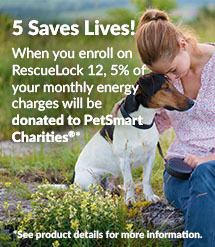 Through its CARE Program, utilities offer a monthly discount for those who qualify and participate in the program. This discount is applied to both its distribution rates, as well as the energy usage rate. When participating customers switch to an energy supplier other than the utility, they will continue to receive the CARE discount on the distribution portion of their utility bill. Since the utility is no longer supplying the natural gas itself, this discount no longer applies to the energy portion of the bill. If you are a CARE Program participant and are considering switching to XOOM Energy, please review and evaluate our plans carefully. We continuously monitor the market and price our plans competitively to give our customers the best rate possible. No additional discounts are offered to CARE participants. Paperless Billing is an eco-friendly and convenient way to receive your XOOM Energy bill. Instead of receiving a paper copy in the mail, you will get an email letting you know your bill is ready to view. All you have to do is go to your MyXOOM account and view your bill directly from your computer or mobile device! It's that easy! *Available only in Texas, SoCal, and SDG&E. If you have not yet enrolled with XOOM Energy, you can select Paperless Billing during the enrollment process. If you are already a XOOM Energy customer, you can go to your MyXOOM account and opt into Paperless Billing or call XOOM Energy Customer Care at (888) 997-8979. The Balanced Payment Plan is only available on the utility (PG&E) portion of your charges. If you are currently enrolled on a Balanced Payment Plan, you will remain on it after switching to XOOM Energy. If you are not enrolled on a Balanced Payment Plan and would like to be, please contact PG&E Customer Care at 800.743.5002. The Level Pay Plan is available on both the XOOM Energy and utility (SDG&E) portion of your charges. If you are currently enrolled on a Level Pay Plan, you will remain on it (after switching to XOOM Energy) for your utility (SDG&E) charges, but you will need to contact XOOM Energy to ensure that your XOOM Energy charges are also put on Budget Billing. The Level Pay Plan is available on both the XOOM Energy and utility (SoCal) portion of your charges. If you are currently enrolled on a Level Pay Plan, you will remain on it (after switching to XOOM Energy) for your utility (SoCal) charges, but you will need to contact XOOM Energy to ensure that your XOOM Energy charges are also put on Budget Billing. Will I be charged a deposit? Our service is contingent upon a successful credit review. If your credit review is not successful, or if you do not adhere to a credit review, then you may be presented with the option to pay a deposit. Click here to review XOOM Energy's Deposit Policy. If you plan to move to an area where XOOM Energy offers service, just contact us at least 15 days before your move, and we will attempt to transfer your service to your new location. If XOOM Energy is unable to transfer the service to your new service address, you may cancel your service without penalty. Yes, customers can switch from a variable standard plan to a variable carbon-free plan or a fixed carbon-free product, if offered. 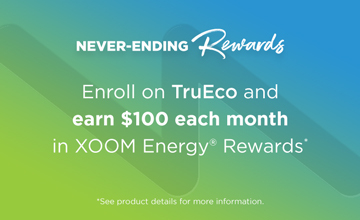 Earn $100 each month in XOOM Energy Rewards* when you enroll on the TruEco variable plan! Promotional Offer: ENROLL TODAY AND GET A LOW INTRODUCTORY RATE ON YOUR FIRST 2 BILLS! * New customers only. DO YOUR PART FOR A BETTER TOMORROW! With TruEco, our variable 100% green energy rate plan, you get the flexibility you need, while also helping to create a better future. Your variable rate may adjust monthly based on market conditions, and if you are not completely satisfied, you’re free to switch. With our TruEco products, XOOM purchases a Carbon Offset on your behalf, which will help reduce greenhouse gas emissions in the atmosphere. This might include restoring forests, updating power plants and factories or increasing the energy efficiency of buildings and transportation. You get the peace of mind knowing that your natural gas consumption in your home is offset, contributing towards a cleaner environment! Rate above applies to all therms used. Available to residential customers only. After the promotional period, this rate may change in the subsequent months at the sole discretion of XOOM Energy. Prices subject to change on a monthly basis. Please note a deposit may be required. Other taxes and fees may apply. Your monthly effective rate will correspond to the service period of your bill. You will receive two bills monthly: one from the utility for the distribution costs associated with your account and one from XOOM Energy, which will include your supply charges. Only the utility account holder or persons legally authorized on the account may enroll. If you are currently under a contract with a retail supplier, understand your obligations and rights before switching. *To qualify for the XOOM Energy Never-Ending Rewards program you must be an active customer on the SimpleFlex product each month. Customers must remain active and in good standing on all qualifying accounts to be eligible. XOOM Energy customers are active when natural gas service is flowing. Should you choose to change your plan to a fixed rate plan, you will no longer qualify for the XOOM Energy Never-Ending Rewards program. XOOM Energy Rewards will be sent via email each month to the email address associated with the customer’s account. XOOM Energy is not responsible for lost, stolen, damaged or undeliverable rewards or items purchased through the XOOM Energy Rewards site. 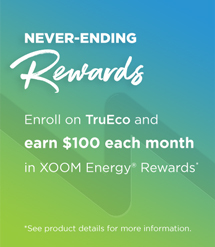 XOOM Energy Rewards do not expire. Other restrictions may apply. Reward enrollment and online/mobile redemption are required before use of the rewards. Rewards are not gift cards or certificates and they have no cash value. Participating offers subject to change. For full terms and conditions visit www.XOOMEnergyRewards.com. Enjoy dinner on us! 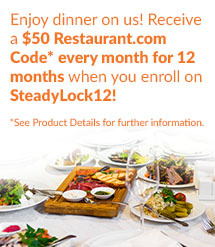 Receive a $50 Restaurant.com Code** every month for 12 months when you enroll on SteadyLock 12! Click here to see wholesale market prices over the past 10 years. Please note a deposit may be required. One year service agreement required. Other taxes and fees may apply. If you cancel your service before the contract ends, a cost recovery fee of $70 may apply. You will receive two bills monthly: one from the utility for the distribution costs associated with your account and one from XOOM Energy, which will include your supply charges. Only the utility account holder or persons legally authorized on the account may enroll. If you are currently under a contract with a retail supplier, understand your obligations and rights before switching. 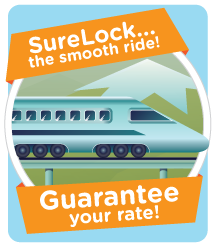 Get the peace of mind you deserve with our SteadyLock 12 fixed rate plan! *Note: Monthly Fee applies to first 100 therms per month. Average current XOOM Residential SDG&E customer uses approximately 40 therms per month. **Available to residential customers of California only. One year service agreement required. Customer must be active and current on the SteadyLock 12 product to receive Restaurant.com Codes. Restaurant.com Codes will be sent via email to the email address associated with the customer’s account after start of service and after every full month of being enrolled on SteadyLock 12. Visit https://www.restaurant.com/theidealmeal/about/terms for complete terms and conditions. Restaurant.com Codes do not expire. Minimum spend requirements for Restaurant Codes vary. Other restrictions apply. XOOM Energy is not responsible for lost, stolen, damaged or undeliverable Restaurant.com Codes, including those that may be lost in transmission. Monthly fee applies only to the commodity portion of your bill. Monthly fee excludes state and local taxes and any charges from your utility. Monthly fee only applies to your energy purchases that do not exceed 100 therms in a billing cycle. Your rate for any energy purchases in excess of 100 therms in a billing cycle will be a variable rate, per therm, that may change on a monthly basis, plus taxes and fees. The average monthly therm usage is based off of XOOM’s customers’ usage. You will receive two bills monthly: one from the utility for the distribution costs associated with your account and one from XOOM Energy, which will include your supply charges. If you cancel your service before the contract ends, a cost recovery fee of $70 may apply. Only the utility account holder or persons legally authorized on the account may enroll. If you are currently under a contract with a retail supplier, understand your obligations and rights before switching. With our fixed rate TruEco 12 Plan, lock in your carbon free rate for 12 full months, guaranteed! This plan offers natural gas price stability for the duration of your term, regardless of market conditions. With TruEco 12, you protect yourself from the uncertainty that comes with energy bills, plus you are doing your part to create a cleaner environment. One year agreement required. Please note a deposit may be required. Other fees may apply. If you cancel your service before the contract ends, a cost recovery fee of $70 may apply. You will receive two bills monthly: one from the utility for the distribution costs associated with your account and one from XOOM Energy, which will include your supply charges. Only the utility account holder or persons legally authorized on the account may enroll. If you are currently under a contract with a retail supplier, understand your obligations and rights before switching. 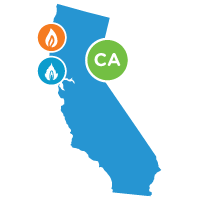 To make sure you're getting the most out of the energy options available to you, look at the choices you have for energy retailers in California. Compare XOOM Energy rates and plans for California natural gas service for your home and business.